One of our most popular Non-Sports cards set is the 1938 Horrors of War card set issued by Gum, Inc. 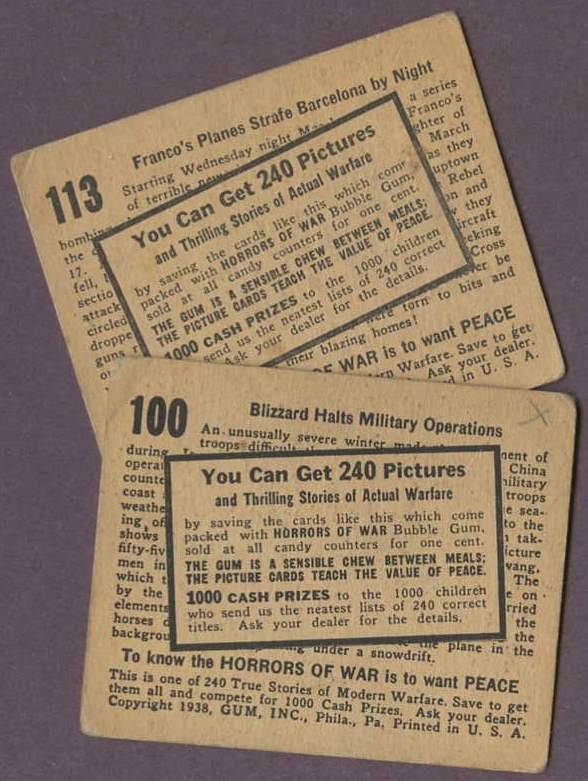 The 240-card set features illustrations of several different international wars and was received very well by the American public, particularly children. Recently, we found several promotion cards, which were designed to be issued at schools. 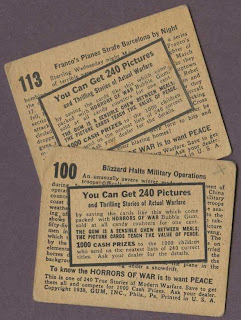 The backs of the cards read "You Can Get 240 Pictures and Thrilling Stories of Actual Warfare by saving the cards just like this which come packed with Horrors of War Bubble Gum, sold at candy counters for one cent. The gum is a sensible chew between meals; the picture cards teach the value of peace. 1000 cash prizes to the 1000 children who send us the neatest lists of 240 correct titles. Ask your dealer for the details." Horrors of War cards are particularly interesting because of the time period in which they were released, but also for their popularity both then and now. We are very excited about these promo cards and we hope to find more like them in the near future.